Printed Ireby A5 Zipped Folios work well as part of any promotional merchandise campaign, and ensure continual high brand visibility. 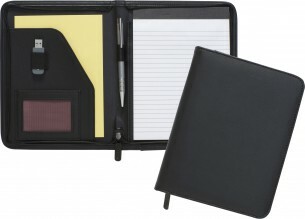 The Ireby A5 Zipped Folio is made from Lightly Grained REACH compliant PVC. REACH ensures that any chemicals used in the making of these products are EU registered and monitored to ensure safety.